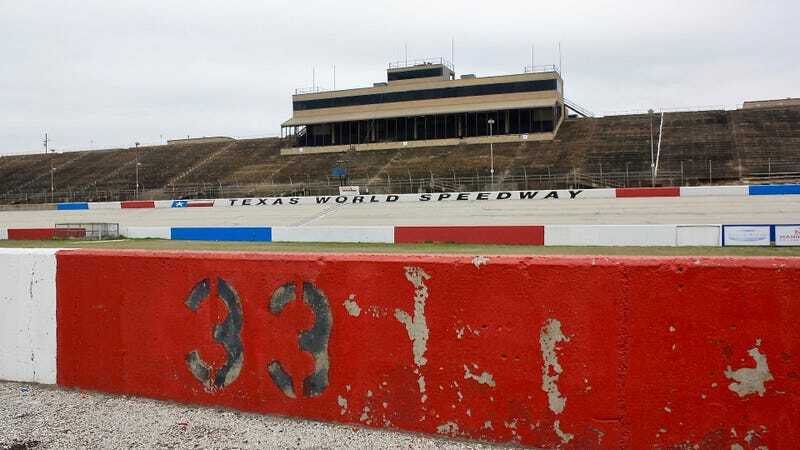 A week-long feud between two individuals in the College Station, Texas area ended in a shooting at former NASCAR facility Texas World Speedway, local police said. The shooting happened during a trail ride at the track, and police told Jalopnik they do not believe any racing was going on at the time. One person was injured in the shooting and officers from the Brazos County Sheriff’s Office responded to it at around 11:30 p.m. ET on Saturday, according to local news station KBTX. Witnesses said the two involved in the shooting knew each other and the sheriff said the dispute had been building for about a week, KBTX reports. The station reported that extent of the victim’s injuries were unclear and that there was no one in custody as of Sunday morning, but that police reportedly have a person of interest. KBTX’s associate news director told Jalopnik that an injured person was cooperating with investigators about the incident. Nathan Dennis, the public-information deputy for the Brazos County Sheriff’s Office, told Jalopnik he doesn’t believe there were any racing events at the time of the shooting. KBTX reports that there was an event called the Four Horsemen Trail Ride and Campout at the track, which appears to host rodeo-like events. Dennis said there aren’t many details nor is there a police brief on the incident yet, since the investigation is still underway. Original reports by KBTX were of a “large fight” at the track, which was picked up from traffic on the police scanner. But due to a broken link to the report and no mention of a fight in the subsequent story by the station, Jalopnik reached out to KBTX and Dennis in order to confirm details. The associate news director from KBTX said the sheriff confirmed a fight and the feud, but both he and Dennis said they do not believe the fight was large. Due to the ongoing investigation and few details, Dennis could not confirm that. Dennis said he thinks it was an isolated incident, but that there was large police response due to the size of the event and the “fear factor” prompted by having so many people there. Dennis called the incident “chaotic” due to size, and said police were just trying to determine those involved and get people evacuated as quickly as possible. KBTX reports that there were about 8,000 spectators there. It’s not the best news for Texas World Speedway, which remains in a limbo that began more than two years ago over its future. Developers plan to pave over the history race track with housing development worth more than $500 million in the growing college town, which keeps expanding outward—and closer to the outskirts-located speedway—after the addition of Texas A&M University into the Southeastern Conference. Jalopnik has reached out to Texas World Speedway for comment as well, and will update if we hear back. The incident occurred during an event created and promoted by “The Four Horseman”, it was a trail ride (horseback) that started and ended at TWS where they camped overnight. The two individuals involved were not affiliated with the trail ride or TWS, it was apparently an ongoing disagreement between the two individuals. The location of the incident appears to be coincidental. Local law enforcement and private security hired by the promoter were in place during the event, the incident was dealt with immediately and to my knowledge no one was seriously injured.